As we learned in POLI 1100 today, Canada is one of small number of countries that continues to have a first-past-the-post system for national elections. What this means is that we divide the country up into 308 single-member districts (divided principally on the basis of the “representation by population” principle), from each of which exactly one individual is elected to represent that district in the House of Commons in Ottawa. In our case, a winner only has to have a plurality of the vote in that district to be elected the winner. What this does is it tends to give larger parties overrepresentation in parliament based on their actual electoral strength. It also gives regionally-concentrated parties (like the Bloc Quebecois) overrepresentation in parliament vis-a-vis parties whose electoral support is more diffuse geographically. 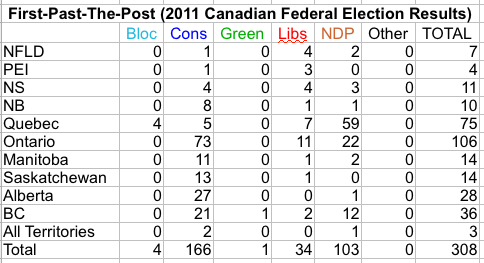 As we can see from the 2008 federal election results, the Green Party received almost 7% of the total national vote, yet because the vote was dispersed across the whole of the country, did not receive a single mandate in the House of Commons. The Bloc Quebecois, meanwhile, gained 50 seats in parliament with a slightly larger percentage of the vote than the Greens! Why? Because the BQ’s votes were geographically concentrated within a minority of ridings in the province of Quebec. Turning now to the 2011 federal election, in which Stephen Harper’s Conservative Party won a majority in the House of Commons with 166 seats (and 39.6% of the vote). See the results below. 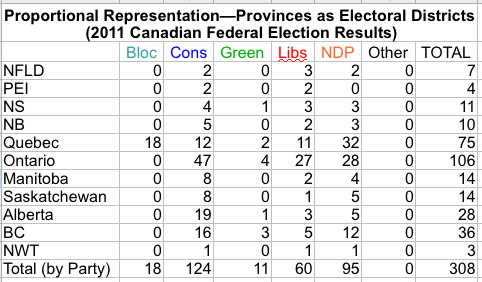 What if, on the other hand, Canada had a proportional representation system in which each province was its own electoral district and seats for the House of Commons were apportioned on the basis of the relative proportion of votes won by each party in each province? What would the results look like? With the help of my students, we were able to calculate the hypothesized makeup of the House of Commons were Canada to have such an electoral system. Notice that the total number of MPs for the Conservative Party has dropped considerably such that the party no longer has a majority in the House of Commons. In fact, no single party has a majority! In order to form a relatively stable government, the Conservatives would have to find willing coalition partners. Unfortunately for them, however, other than the BQ, there is no immediately suitable coalition partner, given the respective ideological stances of the parties in parliament. Even with the BQ, the Conservatives could not get a governing majority, coming up 15 seats short. An NDP/Liberal?Green coalition, on the other hand, would work both ideologically and in terms of numbers (166 seats, exactly the same number as the Conservatives have today). Note also how much a proportional representation system would help the Green Party–from only 1 seat in the House to 11 seats! Which system would you prefer? Do you think that we should maintain the status quo? Should we change to PR? What are some of the advantages and disadvantages of each? Thanks for the comment (and the link), Wayne. I’ve used some of the information provided at the link to write a new blog entry.